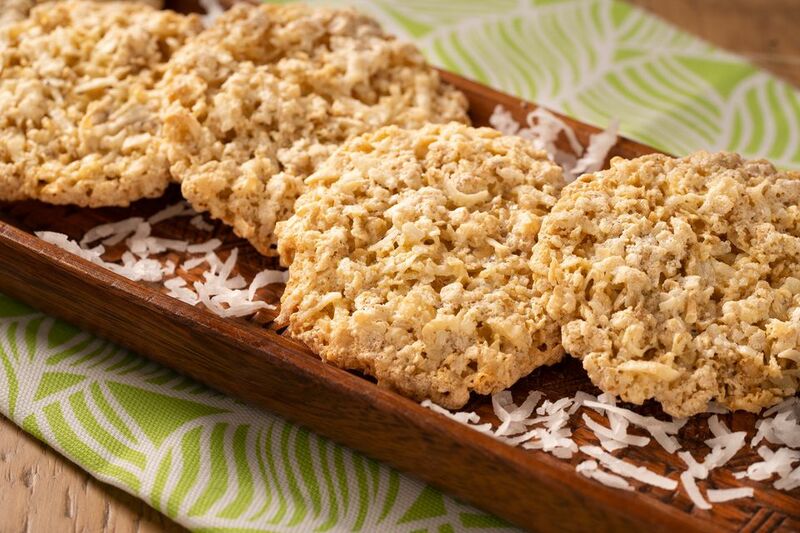 The next time you are looking for a light and crisp sweet treat, try this recipe for coconut cookies. They are made without any flour so they're a great treat for anyone who needs to eliminate wheat products from their diet. The secret to these cookies begins in the first step. Instead of using one whole egg, the egg is separated and the whites are whisked with part of the sugar until soft peaks form. Then the yolk is blended separately with the remaining sugar. Eventually the egg white meringue is folded into the cookie batter to create a light as air dough resulting in a crisp and airy cookie. Heat oven to 325 F. Line baking sheets with parchment paper. Separate the egg and place the white and yolk in different bowls. In the bowl of an electric mixer at high speed, beat egg white until foamy-white and double in volume. Beat in 3 tablespoons of the sugar, 1 at a time, until firm peaks form. Beat egg yolk well in a medium-size bowl; beat in the remaining sugar until fluffy and light. Stir in baking powder, salt, vanilla, rolled oats, coconut, and melted butter. Fold in egg white meringue. Drop by small spoonfuls onto prepared baking sheets, at least 1 inch apart. Cookies will spread. Bake 15 minutes or until firm and lightly golden. Remove from cookie sheets; cool completely on wire racks. Store in tightly covered container. Makes 1 1/2 dozen. For the oats, use quick-cooking rolled oats or old-fashioned rolled oats. Just be sure not to use a packet of instant oats. This product is pre-cooked and dried, therefore won’t work in this recipe. Simply pick up a bag of sweetened shredded coconut. Avoid desiccated coconut which is ground rather than shredded. Also, the long, wide pieces of flaked coconut are also not what you are looking for here. The moist, sweet texture and flavor of sweetened shredded coconut is best for this type of baking. Whenever you are baking, be sure to use high-quality pure vanilla extract. Even though you use just a small amount, the quality of vanilla makes a huge difference in the final product. Of course, read the labels carefully to make sure you are purchasing pure vanilla extract, rather than imitation vanilla extract.